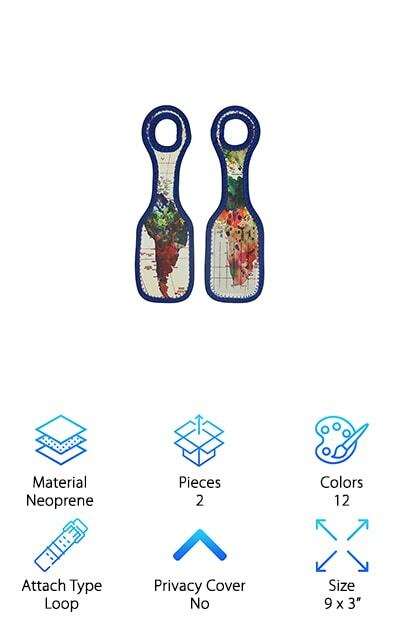 The coolest luggage tags ensure your goods will stand apart and will be easily identifiable once you arrive at your destination. You won't find yourself at home, opening someone else's precious gifts and keepsakes. To help you find the best luggage tags, we researched a variety of new and best selling products. The result is the top ten travel luggage tag reviews below. Before we get started, here’s what you need to know when shopping. 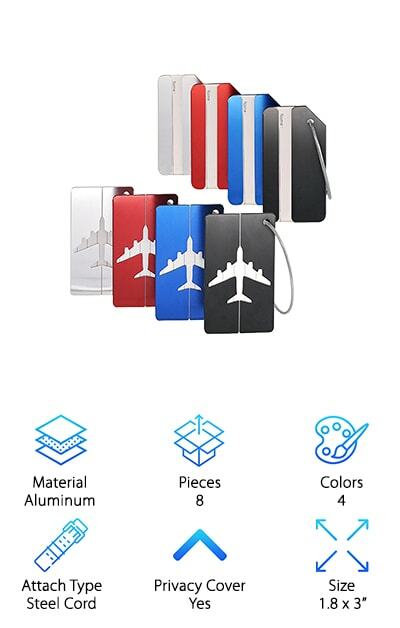 The most durable luggage tags are here! Material: A good luggage tag will last a long time, and the top ten choices below are excellent examples. Some are synthetic, others are rubber and even genuine leather. You will find the ones you like best, we promise! Pieces: Our selections come in pairs, triplicate, or as many as 8 pieces per purchase. Whether you are flying solo or bringing along the entire brood, we have great options for both scenarios. Check our chart for the number of pieces included. Colors: We have military luggage tags, tags designed by professional artists, neon colors, and more muted options too. The "color" category is where you can see how many design or color options you get with each brand. Then go select your colors! Attach Type: So you found the perfect tag or pair of tags, but you want to make sure they will tie onto your duffel bag or your work suitcase. Check the attachment type so that you know if you’re getting loops, buckles, etc. Privacy Cover: The privacy cover keeps personal information hidden. It peels back to reveal the section where you have written your name, phone number, and/or address. Many of our top ten have privacy covers for that added touch of security. Size: A tag that stands out should also be big enough to be spotted across a terminal or piled up amongst other bags. All of our picks are generously sized. We noted the length and width of every single one for you. Now that you know how to choose a great luggage tag for your next journey, let's get right to the reviews. Here's the deal: If you're in a hurry, take a look at the top pick and the budget pick. Both are fantastic products and are among the very best luggage tags we found. Right below, you'll find all runner-ups in our tag reviews. If you're looking for the best luggage tags for travel, they are on this list. Have you set sights on an amazing destination, and now it’s time to pack up and go? One of the most daunting things we deal with during travel is keeping all of our bags and suitcases safe and easily located. One of the best ways to cope with the problem is to make your stuff clearly identifiable, with personalized luggage tags. Our top pick is the Proud Guy Luggage Tags. While most tags are usually plastic, these are made of aluminum. They will last for years. They come in a rainbow of unique colors, including red, blue azure, deep amber, deep purple, and emerald. They each attach to your luggage with a steel cord, so the chances of these tags getting ripped away on accident are reduced. With your purchase, you receive two tags. That's not all: You will also get a personalized PDF in an email to create your own name, initials or number sequence. Get ready to travel! You want to find your luggage or your bags quickly, and keep moving toward your destination, right? But you don’t want anyone else discovering that information for themselves. That’s why Shacke Luggage Tags are such a smart buy. First off, they are our budget pick, which means they are supremely affordable. Made from bendy and flexible rubber, they survive air travel, car travel, or just a daily trip to the gym. And with their added privacy covers, your critical information is hidden until you need to verify it. You get two of the Shacke Tags, in a choice of 6 colors: Teal, pink, orange, green, red, or yellow. Each attaches to your bags with a thick steel cord. The airlines only offer paper tags, connected with string, so this option is far superior! The tags measure 4.5 by 2.5 inches, and in these bright colors, are hard to miss coming down baggage claim. Security doesn’t have to be boring! When you take your next trip, do you want the force to be with you? A Stormtrooper, BB8, R2-D2 and Kylo Ren are the buddies you need on your next journey. What are we talking about? Finex Star Wars Luggage Tags! 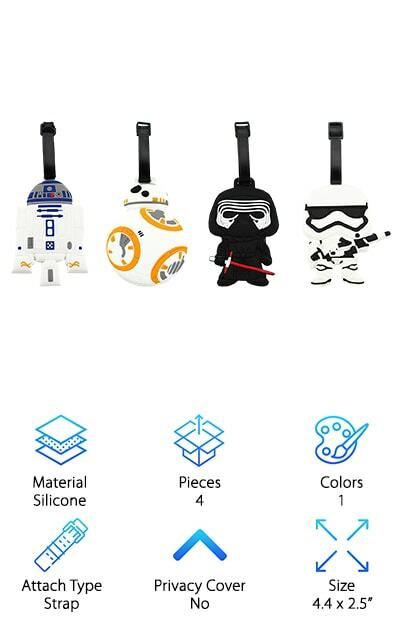 Perfect for families or a Star Wars galaxy enthusiast, these tags will have you going from planet to planet in style. Aside from how much fun these are, they're smart, too. When your luggage looks like everyone else's, it makes sense to have your tags stand out. You don't need to be headed to Disneyland for a Star Wars luggage tag to make sense! These are big, too, measuring 4.4 by 2.5 inches. They won't get lost, and they will be easy to spot. They are made of bendable silicone. Each has an adjustable strap, so they will attach to any kind of suitcase. They make a great gift for the science fiction geek in your life, too! Are you headed out the door, and you need to make sure everything you are bringing with you won't get lost when you arrive at your destination? Whether you are going around the world or down the street, it's always helpful to add a tag with personal information to your items, just in case they get lost. What’s even more helpful is a handy-dandy privacy cover, so that info stays sealed until you need to check something out, or make sure a duffel bag or suitcase belongs to you. Our reviewers highly recommend the Travelambo Luggage Bag Tags. These are both elegant and durable, made of high-quality genuine leather. You will get a two-piece set, with color choices including green, pink, and blue. All of them stand out in a crowd. 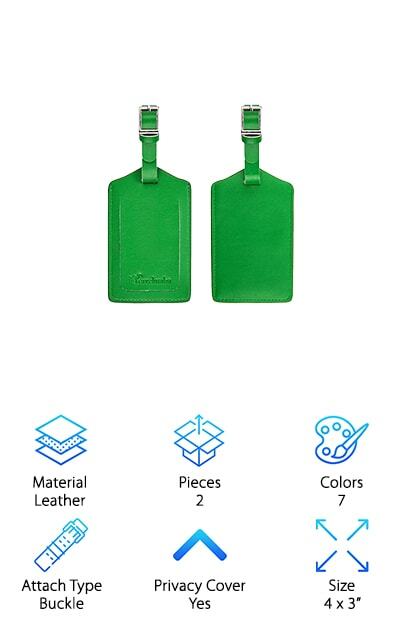 The leather strap connects to a stainless-steel buckle, and that's what you use to attach these to your luggage. The included cards also have two sides for adding personal details. Tell us if this sounds familiar: You get home from a fantastic vacation, head into your home and begin to unpack. To your horror, a bag is missing, or you've managed to take someone else's belongings with you instead of your own. Did this ever happen to you? It's a real hassle, and it is easily preventable with the right accessory: The well-crafted luggage tag. Aootech Luggage Tags are created for the smart, savvy traveler. They help you get where you need to go without second-guessing which bag is yours because each one features a unique design. 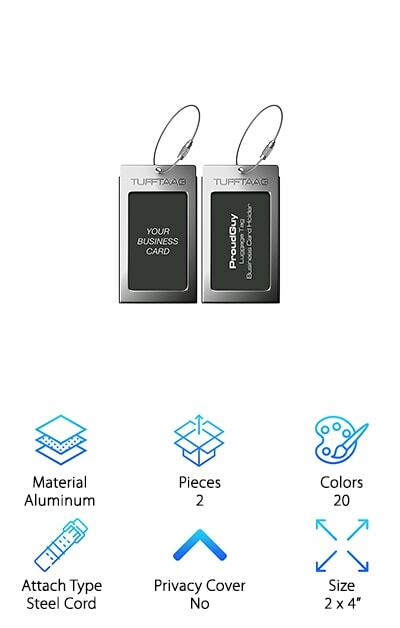 These aluminum alloy tags with steel cords come in a pack of 8. Four of them have a clean stripe down the middle, and the other four contain the emblem of an airplane. Each set of four is silver, black, red, and bright blue. They contain ID cards that are ready to fill out, and stay hidden until you need to slide them out. Never, ever stand in the middle of an airport again, wailing “I can’t find my bags!” Those drama-filled days are over, thanks to the Art of Travel Designer Tags. You have never seen tags like these. Each pair features a design created by a professional artist. There are 12 pairs in all to choose from, made from neoprene. Select from images like red suns setting over an ocean, from Budi Kwan of Indonesia. Michelle Li Bothe from Germany created a shy red fox, seated at the base of a gray birch tree. And Tobe Fonseca of Brazil made a whimsical black and white print of layered cats. Each set of two tags can be looped onto your suitcases, with the ID card placed in the back. They measure 9 by 3 inches, so they are hard to lose. It gets better: They are also resistant to stains and can be cleaned with a wipe or a damp cloth. 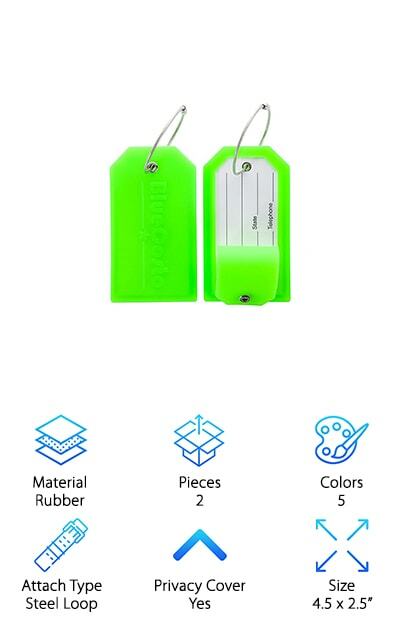 Nothing shines quite as brightly as neon luggage tags! 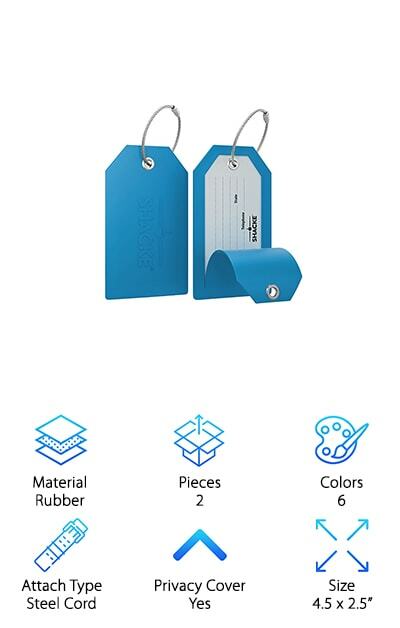 And BlueCosto manufactures not one, not two, but 5 different shades of neon tags, including neon green, red, orange, and yellow – there’s black, too. From businessmen to tour groups, these luggage tags are a smart purchase. They are made of durable, flexible PVC rubber. You can literally fold them in half, and there won't be a mark on them. Use the steel loop to place the tag on a backpack, carry-on, suitcase or duffel, and it will not disconnect or break. A blank information card is included inside, and once it is all filled out, you can just fold up the privacy cover and hide it all away. Your most sensitive information will be concealed from prying eyes. Don't want to use the blank cards that come with purchase? A professional business card fits perfectly into the provided space. No weird smells or textures, no hassles, just happy traveling. Do you get a kick out of personalized items, but you don't like how much they cost? It doesn't get smarter than the Highwind Initial Luggage Tag, which comes in 26 different styles and colors. Yes, you guessed it, each style is a different letter of the alphabet! So, Diana, Bob, and Phil can each have their own tag or set of tags. Not only can your group identify their bags easily, each person will know which suitcase is theirs. This makes a wonderful gift for the avid traveler, for the high school grad about to backpack through Europe, or the retiree going on a Mediterranean cruise. All of them will love that you took the time to find something special, just for them. 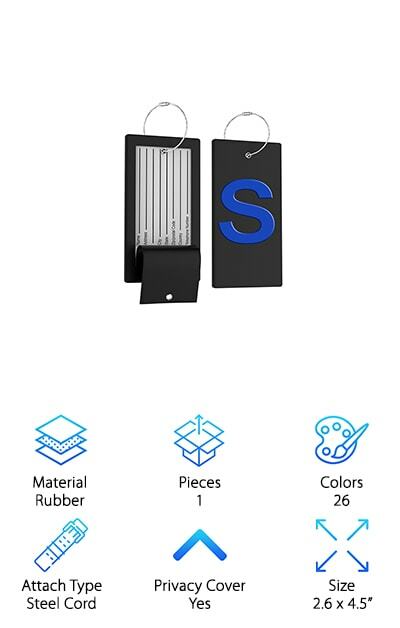 The tags measure 2.6 by 4.5 inches and are made from highly-bendable rubber. They attach to bags with a steel wire, so they won't be disappearing halfway through a trip. Give a gift that shows you care! Accio, brand new luggage tags! “Accio” is the summoning spell from the world of Harry Potter, one of the most popular novel series in the history of books. If you don’t believe us, just look at the sales numbers. That’s also the reason why these Harry Potter Luggage Tags are so incredibly cool. There are 9 different choices! 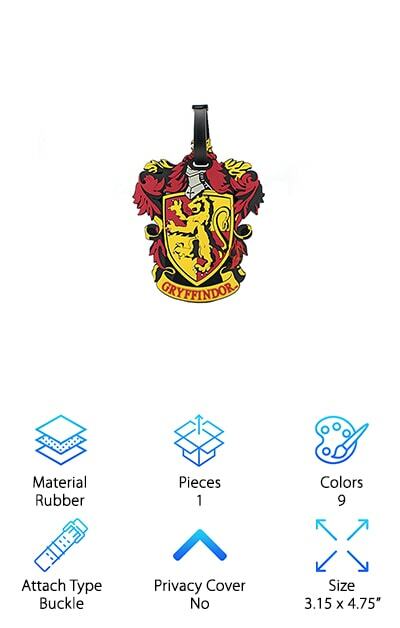 There are the 4 schools of Hogwarts, Slytherin, Gryffindor, Hufflepuff and Ravenclaw, and the logo of Hogwarts School of Witchcraft and Wizardry itself. You can also label yourself with the logo from the Department of Magical Transportation, or the Magical Congress of the United States from Fantastic Beasts. Let your imagination fly with you! This is crazy: While these tags are a lot of fun, they are also made really well. They are made from flexible rubber, with buckles to attach to luggage or backpacks. A blank ID card is included. The magical world of Harry Potter and his friends will enchant! Members of the military, veterans, and their families are proud to wear the insignias of the U.S. armed forces. 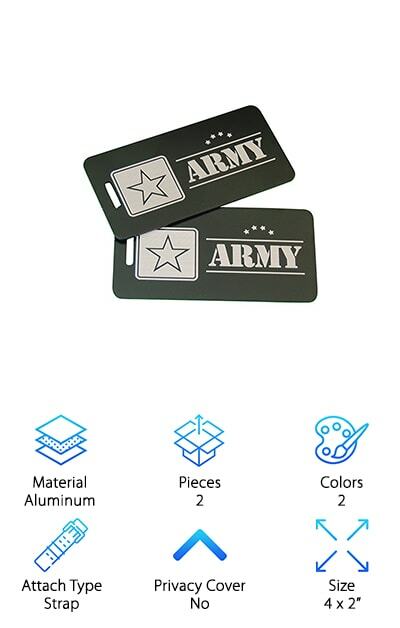 Now people who serve or have served in the U.S. Army have a great way to identify themselves as they travel, with these US Army Luggage Tags from Airspeed Junkie. These tags are made in the USA. They are crafted from aluminum, and they come in two colors: Blue and silver. Emblazoned across each pair is a star and the word "Army." It is engraved on both sides. Straps are also included. These come at a very economical price and make a wonderful present for the Army hero in your life. Whether you are embarking on a trip or simply want a new accessory for a work bag or a gym bag, this is a good choice. The tags measure 4 by 2 inches, and they won't get banged up by luggage handlers or bad weather. Say it loud and proud!